Nellie May Concidine, c. 1905. Unknown location, probably Grand Rapids, Kent Co., Michigan. [ADDRESS FOR PRIVATE USE,] Spokane, Washington, 2018. Last night, I was lost in thought, looking toward my dining room wall, which I call my "Ancestor Wall," since so many of my ancestors' portraits grace it. 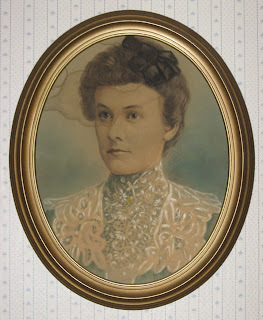 My eyes fell on the portrait of my adoptive great-grandmother, Nellie May (Concidine) Holst (1883 - 1953). Nellie...hmmm. Was her first name really Nellie, or was it Eleanor? Maybe I needed to double-check her birth record to see how her name was originally recorded. Then I realized that I wasn't sure I had her birth record. 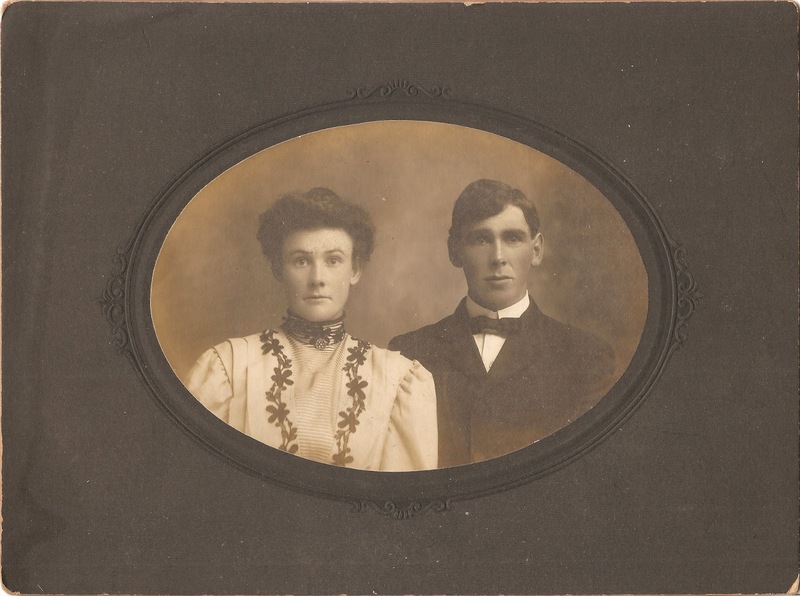 Nellie May (Concidine) and Alfred Henry Holst, c. 1905. A little background: Nellie was born in Byron Township, Kent County, Michigan. She was the second child and first daughter of half-Irish, half-Scots John Dennis Concidine (1854 - 1925) and Anna "Annie" Matilda Higby (1861 - 1903), a woman whose roots go back into colonial New England. After teaching for a few years, Nellie married a German-Swedish immigrant, Alfred Henry Holst (1882 - 1952) in 1905. They had a set of twins, Earl and May, who died in infancy in 1909. Then they had my grand-aunt, Lucille, in 1918. Hoping to enlarge their little family, they fostered and later adopted my paternal grandmother, born Jane Marie York, whom they named Jeanne Marie Holst. I looked in my family tree software, RootsMagic, and the only sources I had for Nellie's birth were family records, census records, and her death certificate. I looked in my electronic files and did not see a birth record for her. So off I went to FamilySearch to look in their Michigan Births, 1867-1902 collection. "Michigan Births, 1867-1902," database with images, FamilySearch (https://familysearch.org/ark:/61903/1:1:NQCN-TZQ : 10 March 2018), Anna Corcadine, 16 Dec 1883; citing item 2 p 344 rn 1287, Byron, Kent, Michigan, Department of Vital Records, Lansing; FHL microfilm 2,320,696. Her name was...Anna? What in the world? You need to understand how birth records in Michigan were created, prior to birth certificates being issued in 1905. The town supervisor or a city clerk would canvas his area once a year, going door-to-door to record all the births and deaths that had occurred in that township or ward the previous year. Remind you of anything? Yes, the census. Vital records, births and deaths, were recorded census-style in Michigan, from 1867 to 1895 (death records) and 1905 (birth records). After 1895/1905, death/birth certificates were issued. So all the issues we have with people going missing or having incorrect information recorded on censuses applies to birth and death records in Michigan from 1867 to 1895/1905. To add to the rates of error, we're not exactly sure what happened to these original recordings. The information was copied into the county birth and death libers, many of which have been microfilmed by the Family History Library. Then the information was further copied and sent off to the secretary of state, and recorded in the state birth and death libers, also microfilmed by the Family History Library and now digitized and available online as the Michigan Births, 1867-1902 collection. I have not been able to find what the town supervisors or city clerks did with those original records they made when going door-to-door. They do not seem to be in existence. So the record viewed above is actually the third recording of the information of Nellie's birth, copied from the county record, copied from the door-to-door record, which was recorded in May 1884, five months after Nellie's birth. We also do not know who gave out this information to the recorder: her mother...her father...a relative living in the home...or a neighbor? I am now more stumped than ever. Was Nellie originally named Anna (after her mother), but then the family decided to call her Nellie? Was Anna a recording error made by the town supervisor, or did it get mis-copied from the original (for instance, did one of the recorders glance at the mother's name and write it as the child's name)? Also, our family records state Nellie was born on 23 December 1883, but this record says 16 December. Sometimes, finally being able to access the record generates more questions than provides answers! In these cases, careful comparison and analysis between multiple records that contain similar information must be made, and a reasonable conclusion must be drawn, understanding that more than one reasonable conclusion can be made. What I am sure of is that Nellie was born to John and Anna (Higby) Concidine in Byron Township in December 1883. I will look for other sources to which to compare the birth record and come up with the best reasonable conclusion about her name and her birth date.